The educational community is formed by teaching and administrative staff who work together to train future professionals with a style that combines approachability, presence, placing value on work, and personal attention to every student. 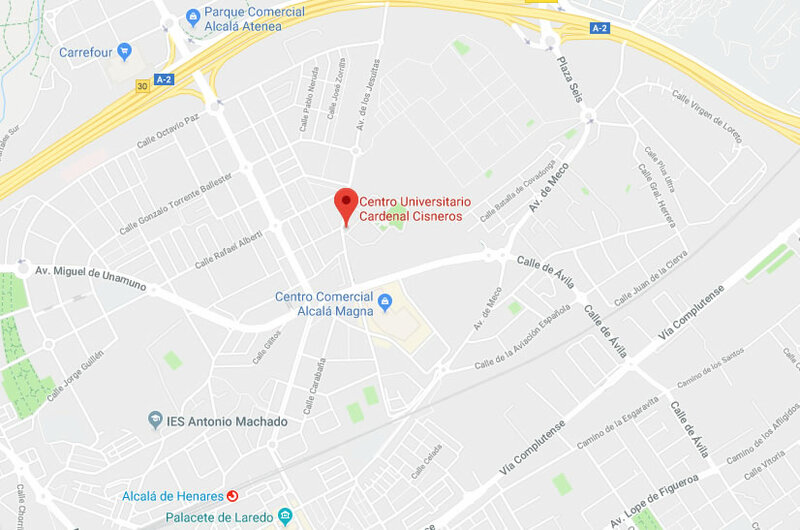 Centro Universitario Cardenal Cisneros is owned by the Cardenal Cisneros Foundation and governed by its Board of Trustees. The Marist Brothers religious congregation, which is represented by the foundation, is the promoting entity of CUCC. The Management Team is responsible for the management and direction of CUCC. It is formed by the Managing Director (Montse Giménez Hernández), the Director Delegate of UAH (José Luis Marcos Lorenzo), the Assistant Academic Director (Cristina Laorden Gutiérrez), Assistant Director of Educational Innovation and Research (Raquel Fernández Fernández), the Coordinator of the Pastoral Committee (Carlos Sánchez Camacho), and the Representative of the Owning Entity (Olegario Crespo Serrano). The University Board represents the different departments of CUCC and governs academic life at the centre.